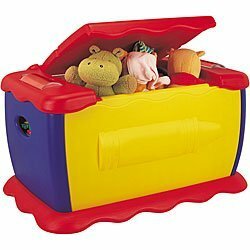 This spacious Toy Box has a removable 2-sided cover with chalkboard surface for drawing fun, eraser included. Two side compartments hold smaller accessories. 45 gallon capacity. Dimensions: 20L x 32.4W x 18H in. If you have any questions about this product by Grow'n Up, contact us by completing and submitting the form below. If you are looking for a specif part number, please include it with your message.